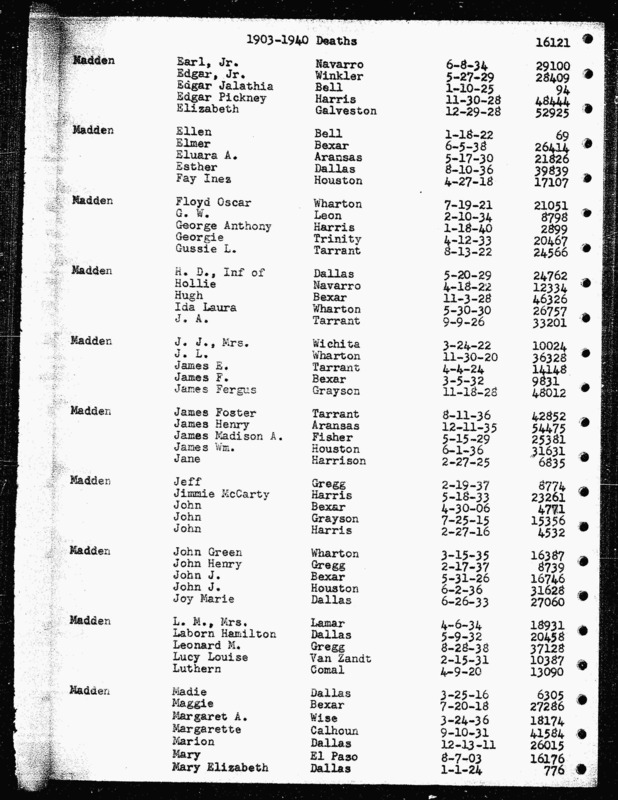 Son of Anderson Smith Randal and Sophia Mitchell, Elisha Burrell Randall was born abt. 1859, in Lavonia (Franklin County), Georgia. Elisha was most likely named in honor of Sophia's brothers, Elisha W. Mitchell & Burrell Mitchell. 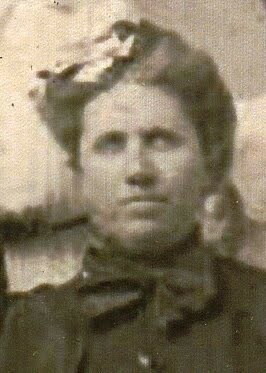 In 1878, Elisha (age 19) married 21 year old Mary Elizabeth Griffin (born September 13, 1856 in Hartwell, Hart, Georgia). Mary Elizabeth Griffin was best known to friends and family as “Mollie”. U.S. Census - 1880. Elisha Burrell Randall's family begins on line 90. Mary Elizabeth Griffin Randall then married Labourn Hamilton Madden (Sept. 14, 1851 - May 9, 1932). Labourn Hamilton Madden was an older brother of Jeremiah Gose Madden; who had married Susan “Susie” Jane Randall (sister of Elisha Burrell Randall). 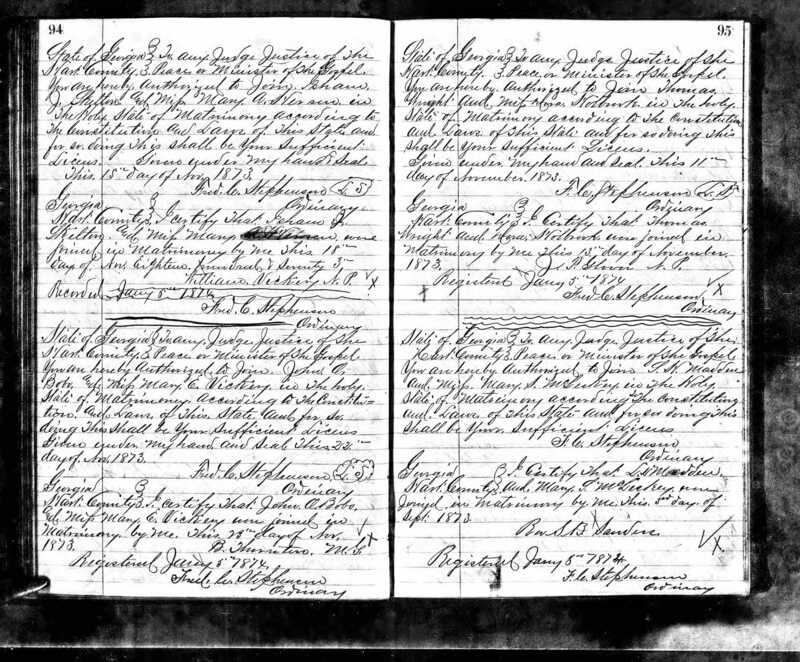 Elias Edward Madden (1876 - 1948) - Married Ruth D. Isom in 1899. Martha Emma Madden (1879 - ) - Married Lindsey H. Isom. It is not certain what happened Mary Sena (or Lena) McLeskey. 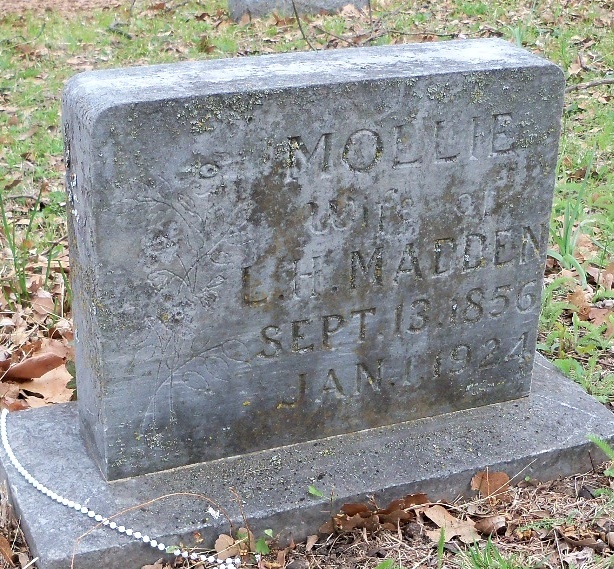 It is assumed that she died shortly after the birth of Isham Madden in January 1883. We do know that Mary Elizabeth Griffin Randall married Labourn Hamilton Madden sometime between 1883 and 1887. 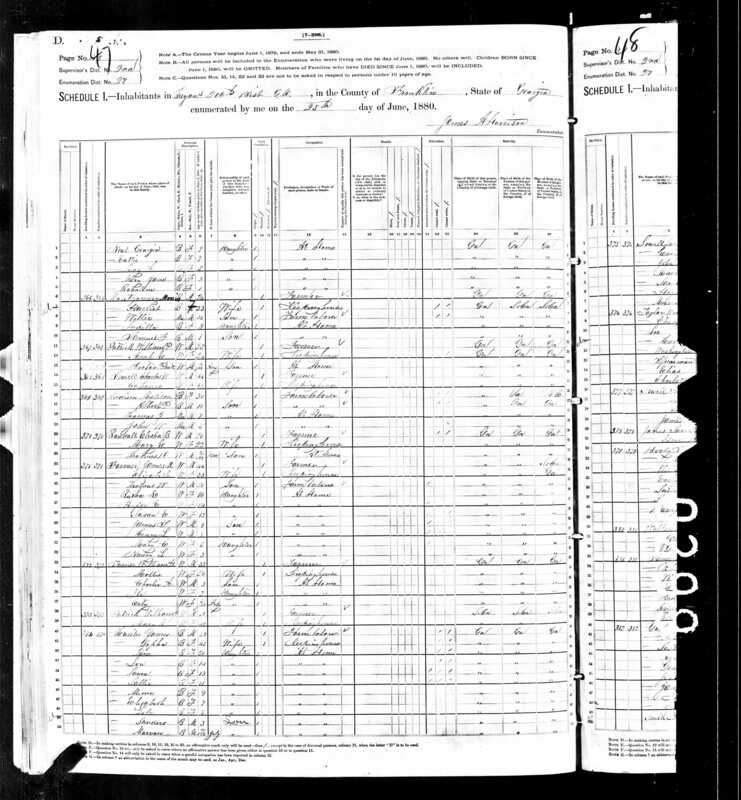 On Jan. 1, 1924, Mary “Mollie” Elizabeth Griffin-Randall-Madden (September 13, 1856 - Jan. 1, 1924) - age 67, died in Dallas (Dallas County), Texas.4) Texas Death Index, 1903-2000, for Mary Elizabeth Madden. 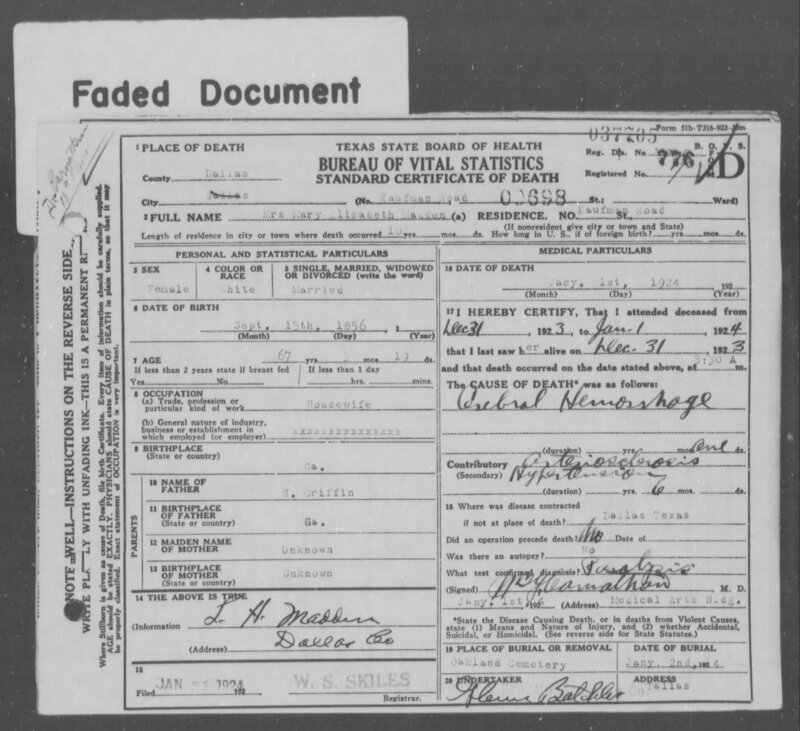 Death Certificate for Mary Elizabeth Griffin-Randall-Madden. Cause of death was recorded as “Cerebral Hemorrhage” due to arteriosclorosis and hypertension. This was diagnosed through “paralysis”.